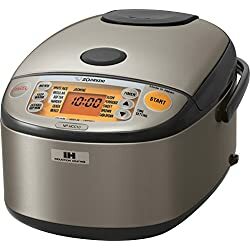 Here folks will find reviews of Zojirushi micom rice cooker models including the popular Zojirushi NS-ZCC18 & 10 models, and the top-rated NP-HTC10 IH pressure micom rice cooker. The “micom” part stands for micro-computerized as these machines will monitor how the rice is cooking instead of just boiling water. A rice cooker with a “brain” in other words. Of course their price may seem worth it and appealing for those who eat brown rice daily and would love to have it cooked to perfection, and the Zojirushi NP-HTC18 & 10 do just that. These cookers have an attractive outer shell stainless steel modern design and come with extra thick rice bowls. Both units offer and use a longer soaking setting called “GABA”, along with Induction Heating and pressure cooking to ensure every grain is evenly cooked to the highest quality texture possible. All while making the rice easier to digest. These micom rice cooker units also have settings for white rice and sushi rice should folks prefer other varieties as well. They come in both 5.5 cup and 10 cup bowl capacity. However, due to their high price tag we recommend folks only make this investment if they plan on preparing brown rice daily and do not mind the longer than average cook times for better results. 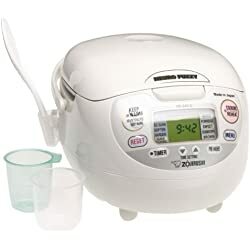 For a Zojirushi micom rice cooker that is a little less expensive yet still delivers very high quality rice, these popular Zojirushi rice cookers are worth a glance. They may not use pressure cooking or Induction Heating coils as like the above units, but do use fuzzy logic rice cooking technology which will monitor how the rice is cooking making fine adjustments in temperature and cooking time along the way. Each selected variety (white, brown, or sushi rice) will come out to an above standard texture and will be a much better quality when compared to stove top cooking. They have a nice modern style and are pretty straight forward to use. The NS-ZCC18 is a 10 cup capacity cooker, the NS-ZCC10 is the smaller 5.5 cup capacity cooker. For a smaller yet very efficient Zojirushi micom rice cooker, we introduce the Zojirushi NS-LAC05. This cooker has a compact 3 cup capacity which is good enough for yielding around 9 cups of cooked white rice. In fact, it is one of the smallest fuzzy logic rice cookers available online besides the Sanyo ECJ-S35K. It performs pretty much the same as the larger NS-ZCC10 and NS-ZCC18 models we quickly reviewed above and will produce very high quality white rice and brown rice. Despite its technical look it is easy to operate, has settings for several rice varieties, and is the perfect solution for single chefs or couples who have limited counter space and want a cooker that makes great guesswork-free rice. 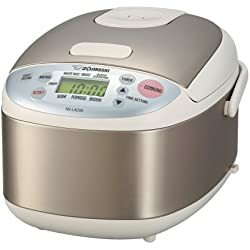 Also take a look at the Zojirushi NP-GBC05 3 cup micom rice cooker as well which uses the GABA method for preparing better brown rice. This concludes our quick Zojirushi micom rice cooker review page. We hoped it was helpful for those looking for a great micro-computerized cooker online!